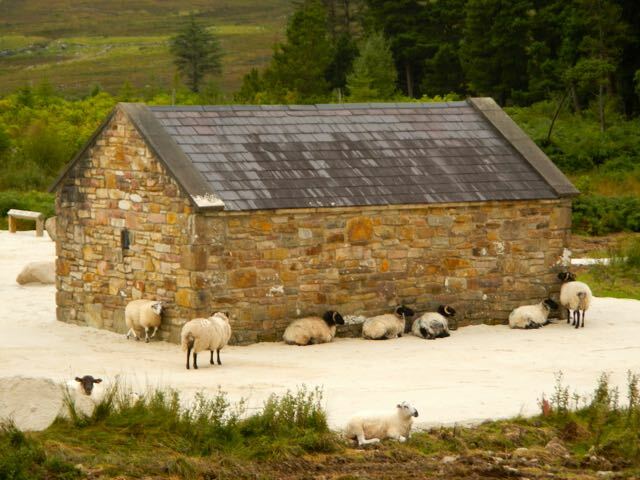 I could have been the loneliest man in Ireland. 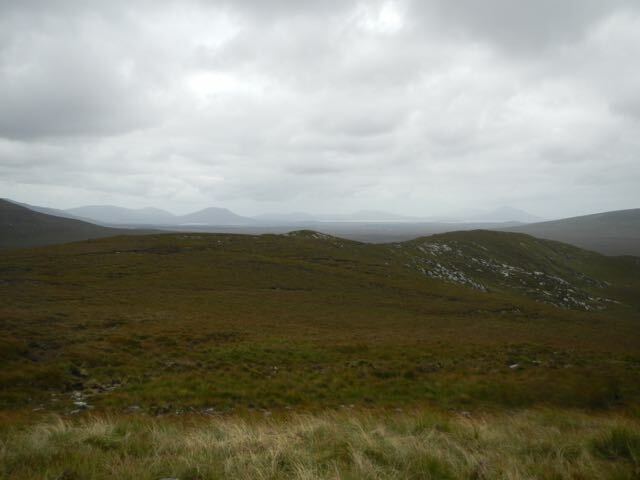 Camping out on a shoulder of Slieve Carr, facing west across the sea of bog towards the great pyramid of Slievemore on Achill Island,I was truly, deeply alone. 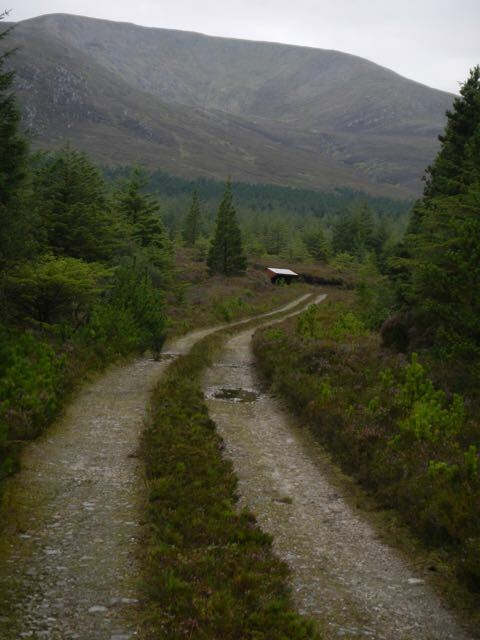 On the Bangor Trail in the Ballycroy National Park , part of the newly designated 22,000 acre wilderness area in the Nephin Beg mountain range, this was as far as it’s possible to get in Ireland from roads, buildings or people. I had a few sheep for company and midges, countless millions of them swooping and swirling like a murmuration of starlings. Retreating to my tent after dinner I swear I could hear them buzzing in their multitudes, like a swarm of bees. Slopping through sucking bog whilst being eaten alive by bloodsucking insects might not appeal to the average sedentary vacationer, but I loved it. I loved the vastness of nothing. 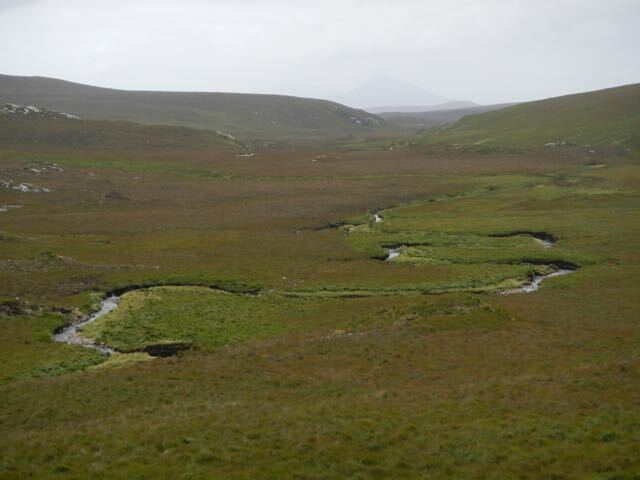 Nothing but mountain sky and bog and a tiny thread of a trail weaving its way north to south from Bangor to Newport in County Mayo. An old drovers road, a trade route,the way home for the few far-flung home steads that once clung to a precarious living in this wild place. 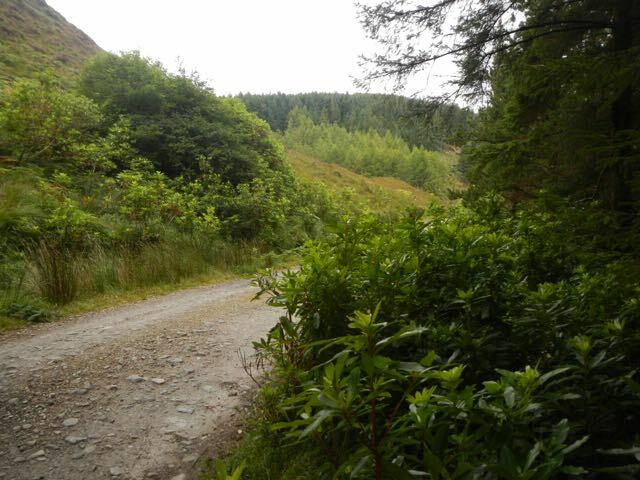 I had started out from the old bothy at the Letterkeen looped walks trailhead and was very alarmed on my way there above Furnace Lough to see the ominous spread of Rhododendrum Ponticum. 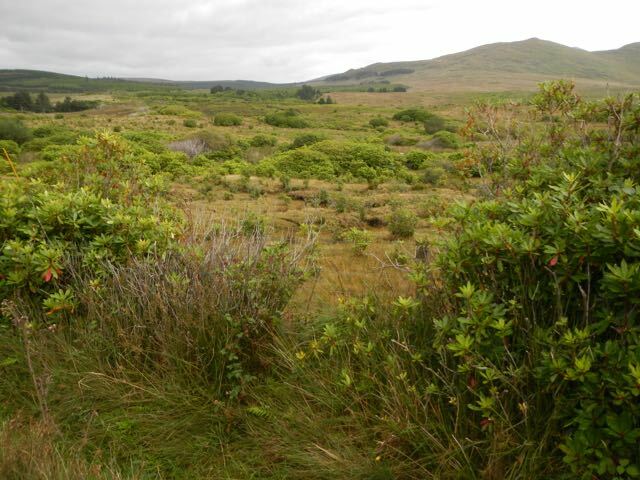 In some areas it was already established into dense woodland and was clearly on the march across the hills, thousands of single stems standing sentry in their shiny green foliage. On a recent hike through Killarney National Park I had witnessed the results of a 30 year war waged against the foreign invader and the news from the front was not good. 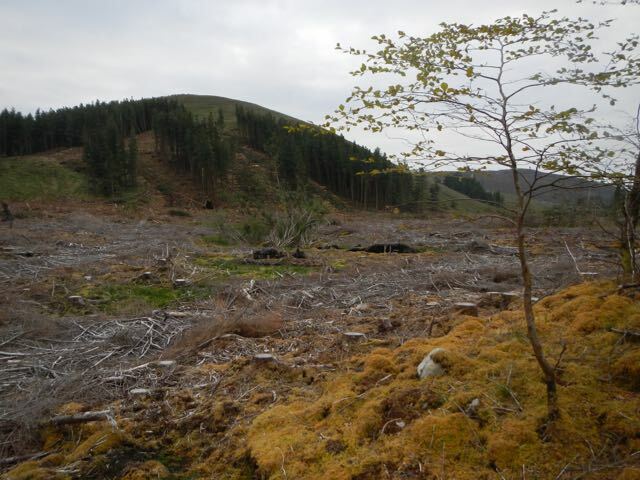 What would happen in the wilderness area where the land management policy was going to be hands off I dreaded to think. 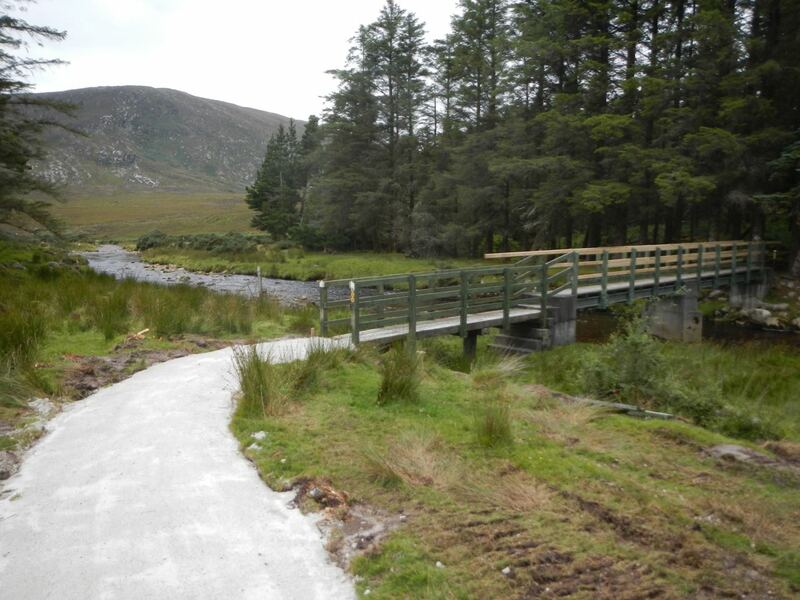 This new initiative sees Coillte working with the department of arts, heritage and the gaeltacht, the national park and local landowners to set aside an area to go wild and to go wild in. The first of it’s kind, the plan is to eventually have 1 million hectares across Europe going” back to nature”. I had decided on a circular route. 30kms on the trail to Bangor, then hitch a spin down the N59 east for about 14kms to where i could join up with the western way. 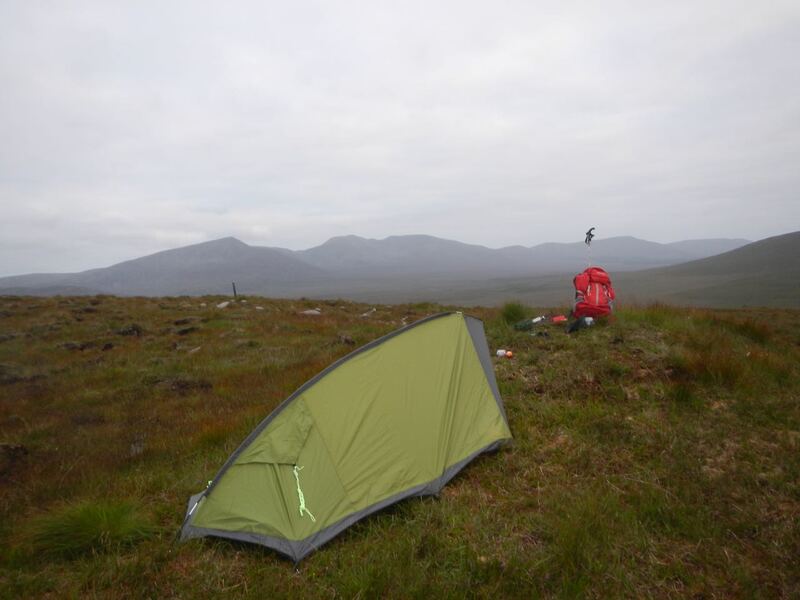 From there it was 25kms back south, mainly through forest, to the Letterkeen bothy. 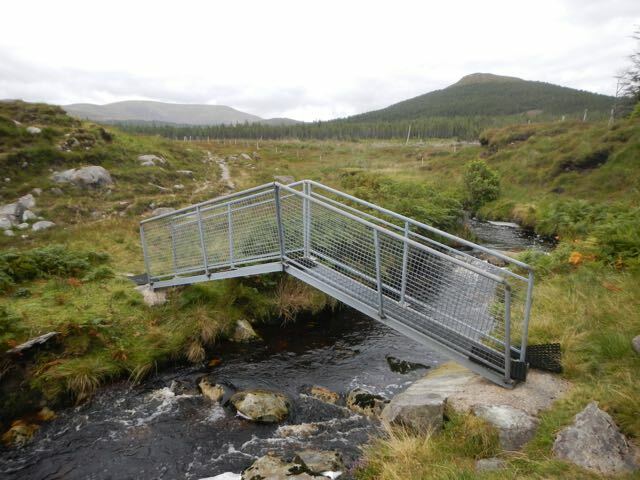 A few yards from the bothy I crossed the Altaconey River and not long after crossed it again on a new steel footbridge. 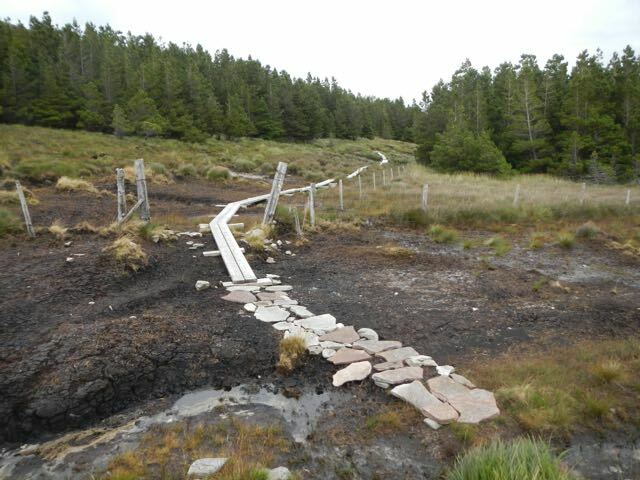 This end of the trail was dry and solid underfoot on a well marked stony track. 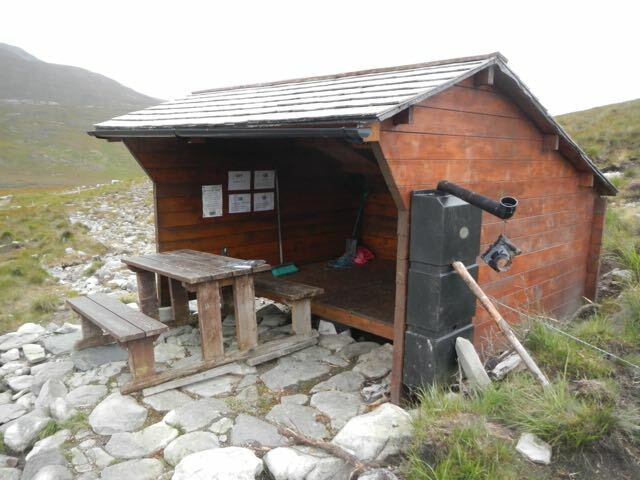 After about 5kms, at a point where one of the loops veered off to the right I came upon one of the wooden hut shelters erected by the Mountain Meitheal volunteers and had lunch while reading the log book there and soaking up the silence .From a notice on the wall I discovered that there was another hut on the Western Way on the other side of Nephin Beg and decided to stay there the following night. Shouldering my pack I carried on up the trail and, leaving the forestry behind, headed into the vast open landscape with the brown bulk of the mountains rising from the bog ahead. 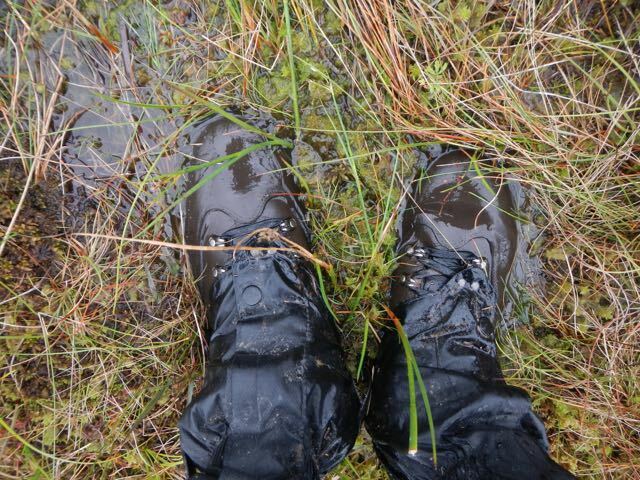 The going became harder and the ground became softer as I crossed what is basically a giant sponge. 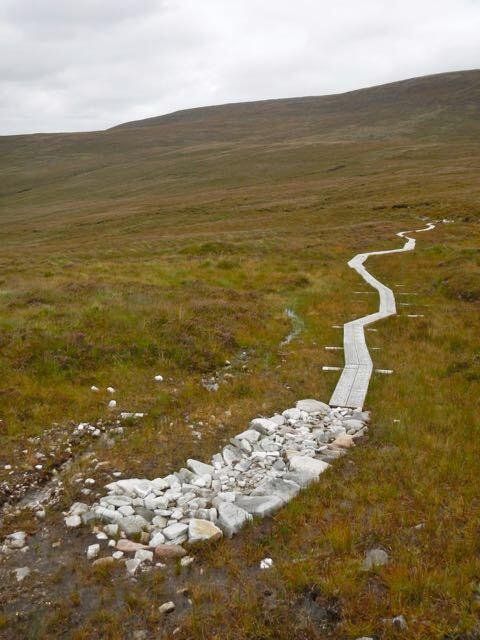 In places sections of boardwalks have been constructed to carry you over the quagmire, but over a 30km trail it could only be a token gesture towards dry boots.It was calm and still and any resting resulted in an attack by the midges which convinced me to head to higher ground to camp in the hope of finding a breeze. 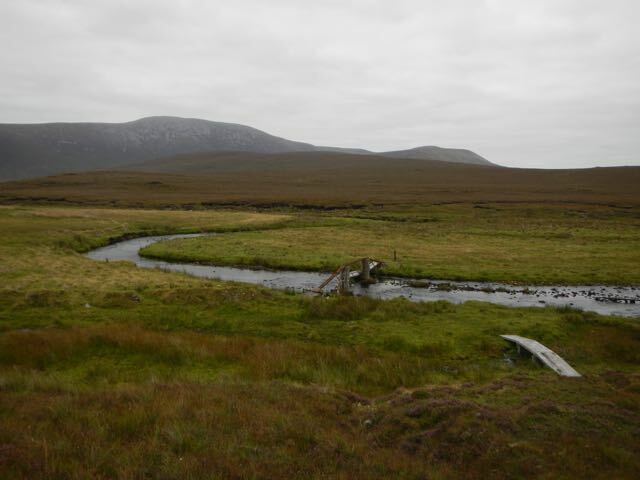 In the morning I headed down to the river valley that cut a meandering course through the boggy wilderness till I reached the broken footbridge across the Tarsaghaunmore River where I managed to scramble across on the wreckage without wetting my socks. 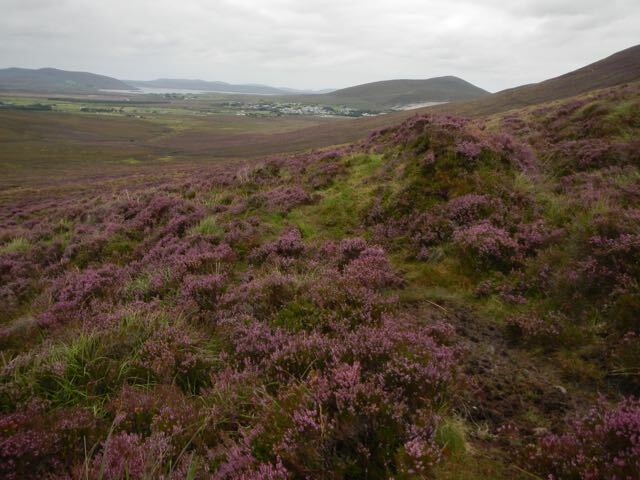 A couple of hours later, as I crossed the purple heather covered hills on the approach to Bangor I spied a lone figure who turned out to be a park ranger, out checking on track work, as surprised as myself to meet anyone else out there . 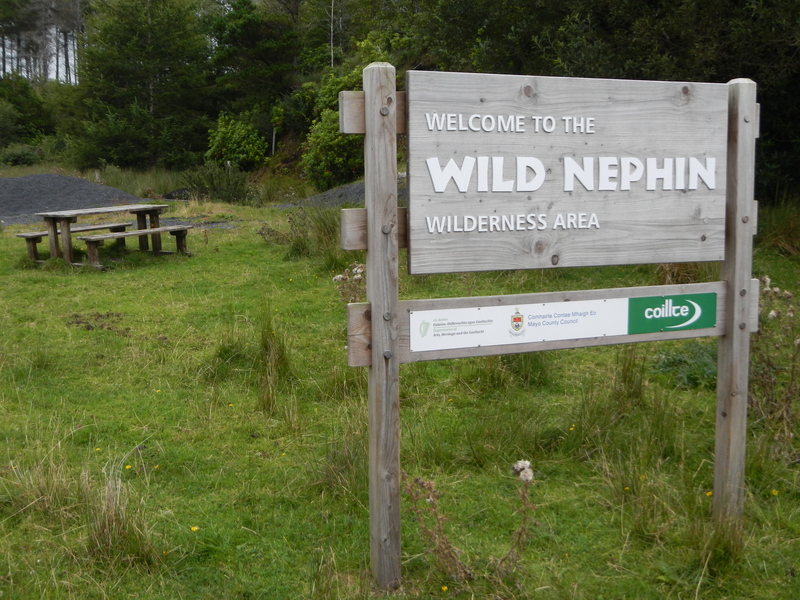 We talked about plans to establish other huts and camping areas, the on going track establishment and the need to balance increased accessibility with an unmanaged “wild” environment. Another half hour brought me into town where,after a pint and a sandwich, I got a lift. 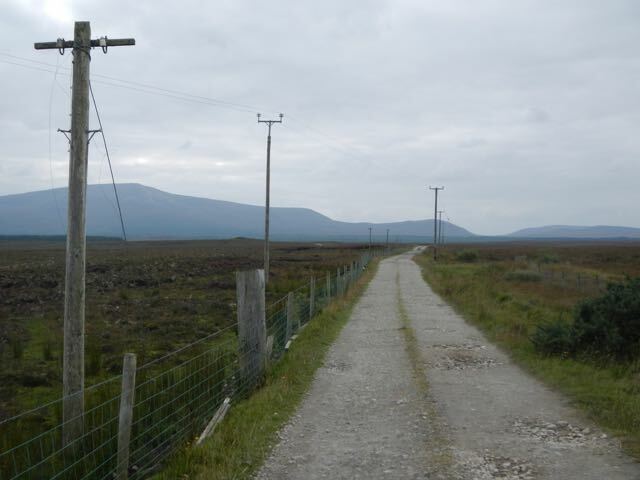 After a day travelling across the landscape at walking pace, the car seemed to hurtle us over the bog at brake neck speed and 10 minutes later I was back to 4kms per hour on the Western Way. 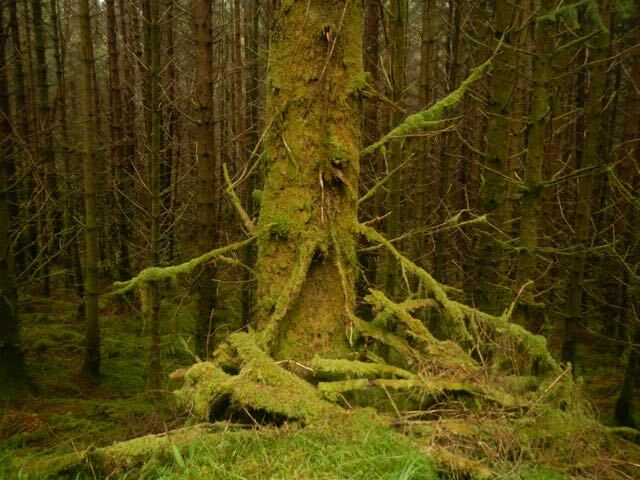 A long boreen led back towards the mountains and an isolated farmhouse on the edge of the forestry . Entering the plantation took me into a different world. From the wide open spaces of bog and sky and seemingly limitless horizons my world became shrunk and enclosed. 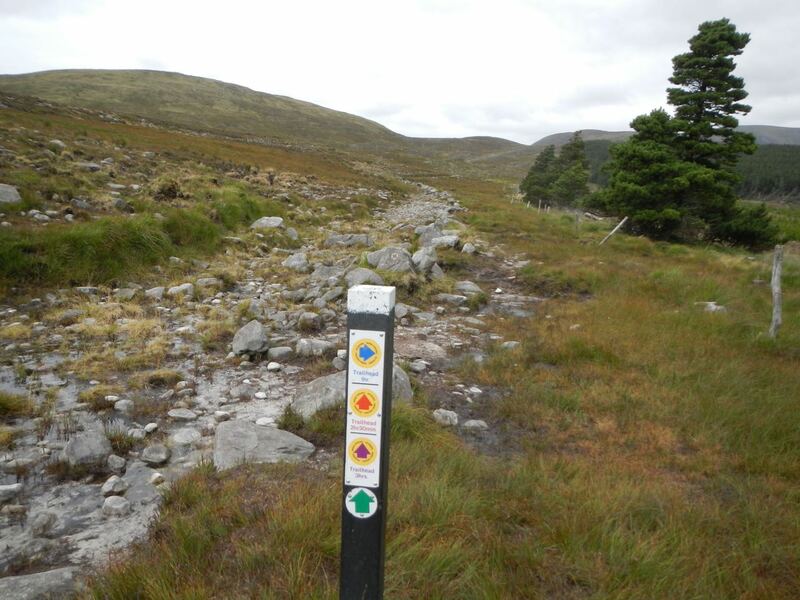 The forestry tracks made for easy hiking and a couple of hours and 10kms later I gratefully came upon a sign that led me up a side trail to the shelter nestling under Nephin Beg. 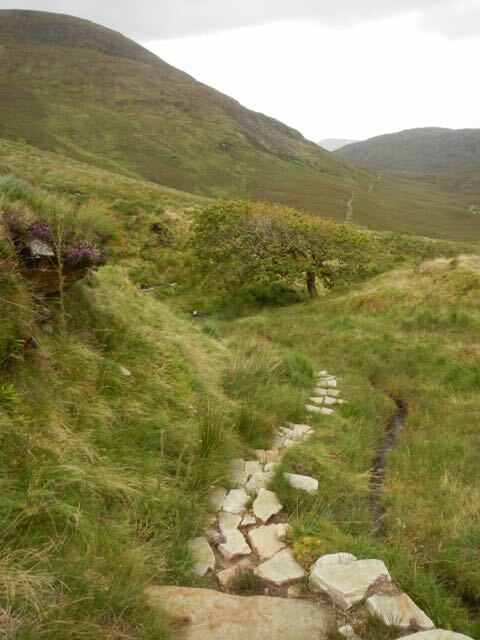 This trail continued up towards Scardaun Lough and the pass through the mountain range. Reading the hut log book I could see that people used the shelter as a base before tackling the peaks above that rose to 720mts on Slieve Carr.Feeling too weary to contemplate such exertion I cooked up my dehydrated meal, erected my tent inside the shelter to avoid the midges and slept. and it’s going to be very interesting to see how this exciting experiment in “re-wilding”goes.